The statistics for women in tech are depressing. Male hacker stereotypes are still problematic and the number of female technologists has been on a steady decline since the 1980s. Entrepreneur and veteran News anchor, Heather Cabot is ready to change this. 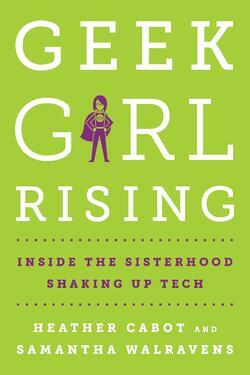 Heather's co-authored book Geek Girl Rising is rallying for the next generation of women in tech. Inspiring stories fill the next 280 pages; stories around women entrepreneurs, female-centric ventures and technologists. The women who through their determination and bravado have earned their place within the digital revolution. Female entrepreneurs such as Joanne Wilson have their achievements exalted, her Gotham Gal venture given due attention. Other important figures include YouTube star Michelle Phan, creator of the e-commerce cosmetics company Ipsy; Industries LLC president, Cathy Boettner; Digitalundivided founder, Kathryn Finney, and Women Who Tech (WWT) founder, Allyson Kapin. Ultimately, this is a book about what is required to succeed. The good, as well as the bad. There are anecdotes on women-led triumphs, as well as women-led failures. They haven't asked for permission from Silicon Valley to chase their dreams, and they will never do so. MA: What have you personally taken away from the experience of publishing Geek Girl Rising? It was a privilege to interview so many accomplished entrepreneurs, engineers and investors. I learned from them that failure or even minor stumbles can be a blessing and that you have to look at adversity as growth moments - personally and professionally - or else you will stagnate. It was eye opening to hear how so many of these women faced challenges and to learn how they turned those moments into opportunities to learn and of course, correct. These are lessons for myself and ones I am trying hard to share with my kids. MA: The book talks a lot about overcoming personal doubt, the impostor syndrome and being brave - publishing a book is an incredible achievement - did you experience any of those feelings and moments yourself? Of course! Every day! But when I started to doubt myself, I really tried hard to remember that it’s in those moments, when you feel uncomfortable or worry whether you can finish or wonder if you deserve to be doing the thing you are doing, that you really are growing. You have to stretch yourself to evolve and also remind yourself that everyone has those feelings. It’s how you channel that energy into productivity that counts. I really try hard to do that. Writing a book is very much like running a marathon (I have run six). There are times when you really feel like you can’t go another mile or spend another hour in front of the computer writing. But then, there are the times when you hear the crowd or stop for a water break and get re-energised that make you realise you can do it. You have to have faith that those moments will come and you just keep pushing through. MA: What's your advice for women who might need a little help believing in themselves? Be patient with yourself. Talk to yourself like you would talk to your best friend. Break overwhelming projects into tasks. Make a calendar. Set deadlines. Tell a friend your plan and how you are going to attack this project or problem. My husband is truly my greatest supporter and he is the one I look to when I am feeling insecure about whether I can really deliver. It helps to talk through my plans with him. It also helps that he is a former 60 Minutes producer and talented storyteller and editor who gets what I am trying to accomplish and the creative and journalistic challenges. MA: What's the most important message you think women - and men - can take away from Geek Girl Rising? Women and people of diverse backgrounds need to have a seat at the table in the businesses shaping our world and we will all be better for it. It’s not only a matter of fairness. It’s been proven time and again that the best problem solving comes from diverse perspectives and viewpoints. How do we get there? It’s a complicated situation that entails more than diversity and inclusion programs inside tech companies. It’s about funding startups led by women and people of colour. It’s about more women and people of colour serving on corporate boards. It’s about creating cultures inside companies that value all kinds of people and what they bring to the discussion - and equal pay is key to that. And yes, it is about breaking stereotypes about who is suited for a career in engineering or entrepreneurship. It’s not just the “hacker in a hoodie” and girls and boys need to see that. MA: What are some of the coolest reactions and responses you've seen the book influence since it was published last year? Meeting young women in high schools and on college campuses has been the highlight. They are hungry for information about internships, camps and after school programs that would connect them with other young women interested in computer science and entrepreneurship. I have personally gotten the opportunity to make introductions and help families find resources for their daughters. There was also a Harvard grad student who chose my book for a project she was presenting in one of her courses on gender studies and she tracked me down to interview me for it. I also did a Skype book club with the Women in Computer Science group at UPenn and I spent an afternoon with middle and high school girls from Connecticut who were learning about starting their own businesses. They were so impressive! MA: On her book publicity tour, Michelle Obama has rejected the concept of Leaning In - has your own opinion of the concept changed in the 6 or so years since Sheryl Sandberg's book was published? My perspective has always been you can have it all but not necessarily at the same time. Life is messy. But that’s what can also make it so gratifying. MA: Is there any update here on how the TV show is developing? What can we expect from the show? No update to share except to say that we were so humbled that Kelly and Mark were drawn to the material. MA: What should we read next? Do you have any book recommendations for women who want to continue being inspired? For pleasure, I recommend Educated by Tara Westover and Small Fry by Lisa Brennan Jobs. These were two of my favourite nonfiction reads in 2018 — both about incredible women overcoming adversity. Fran Hauser’s The Myth of the Nice Girl is a great handbook for women climbing the corporate ladder and offers sound advice. MA: And the next project for you - The New Chardonnay: How Marijuana Went Mainstream, what can you tell us about that? I started working on it right after GGR (Geek Girl Rising) was published and was delighted to sell it to a division of Penguin Random House. It will be out in early 2020. It’s a look at the economic, political and cultural factors that have led to the recent re-branding of marijuana and the stories of the industry pioneers behind this shift. I have had a lot of fun researching the topic which I really knew nothing about initially. I grew up in the Eighties and am a product of the “Just Say No” generation so I have found it fascinating to watch this story unfold as legalised marijuana has become commercialised in the US and to consider what it means for the future. One of the parallels to GGR is that the legal cannabis industry faces many of the same criticisms of the tech industry when it comes to diversity and the opportunities for women and people of colour to capitalise on this new market. This of course is even more pressing when you consider the impact of the War on Drugs on communities of colour and the historically disproportionate number of people of colour incarcerated for marijuana offences compared to whites. The social justice and equity issues that states are grappling with as they begin to regulate these new markets really drew me to the story and my curiosity grew from there.